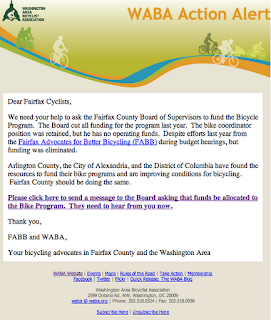 Today WABA sent out an alert asking all Fairfax cyclists to contact the Board of Supervisors to ask them to restore funding to the Bicycle Program. Bicycle Program funds were cut in half in 2010 and eliminated in 2011. The program was originally funded with $375,000. See our earlier post about the 2013 budget. What would the program funding support? Money for shared lane markings (sharrows) placed on busy sections of road to remind motorists that bikes belong on those roads. Repaving of the Fairfax County Parkway trail, and installation of signs to guide users where the trail diverts from the Parkway. It would mean resources to ensure that the Tysons Bicycle Plan and Countywide Bicycle Plan are approved by the Planning Commission and the Board. Building small neighborhood connections so that cyclists can avoid riding on busy arterials that have no bike facilities. Support for Bike to Work Day and many other events to encourage people to travel by bike. Implementation of a bicycle counting program to show the increase in bicycling around the county. And much more. If you haven't done so already, please send a message to the Board letting them know you care about the future of bicycling in Fairfax. At a time when more people are choosing to use bikes for transportation, we should be providing more funding and better, safer bike facilities for these cyclists.